Hold this hat to the light and you will see the many points where light and air can flow evenly through. However this is not a "semi-calado" where the weave is actually woven into the hat with vent holes and a pattern. Rather, this whole hat is what is called locally in Ecuador as a "brisa weave" (windy weave) because air can breathe through due to the openness of the straw patter. This is in contrast with Montecristi hats which are very tightly woven and have almost air tight weaves. Very lightweight, weighing a total weight of about 100 grams, it is quickly produced and economical. It generally comes standard with a fabric sweat band. 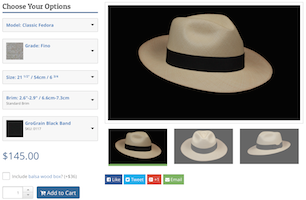 Single woven Cuenca "Brisa" simplest grade of genuine panama hat but is not a Montecristi hat good airy weave with a light weight fabric sweat band. Send us your question about this Cuenca Grade 1 Classic Fedora hat, and we will respond to you as soon as possible. What was the name of the month last month?